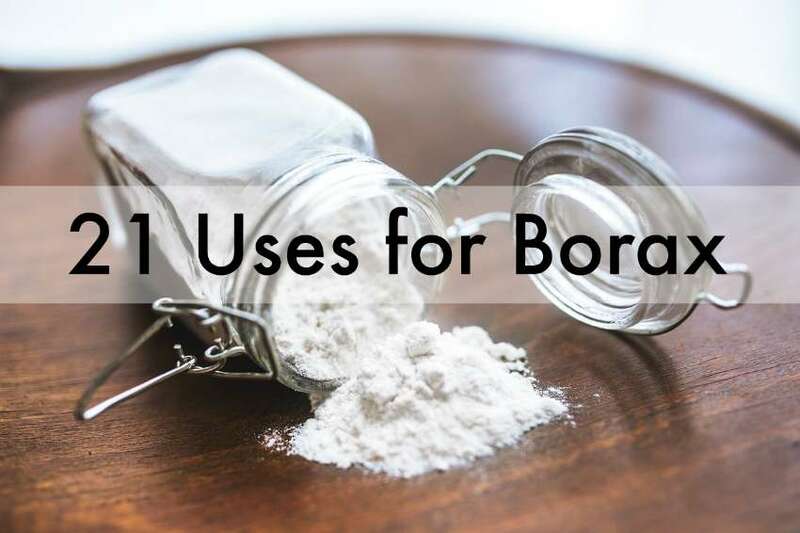 I’ve seen borax pop up in a few homemade household cleaning recipes but I hadn’t appreciated just how many uses for borax there are until I came across this really handy infographic. It shows 21 use for borax around the house! 21! From unclogging drains and cleaning mattresses to inhibiting mould, it seems borax does it all! Although it’s non toxic and a completely natural substance, borax can be a bit of an irritant to sensitive skin. If you do suffer from sensitive skin, skin allergies, eczema or anything like that then I would avoid using it on anything that’s going to come into contact with your skin on a regular basis (e.g. the carpet cleaning recipe, or the clothes deodoriser recipe). Just to be on the safe side! Now we’ve got the safety chat out of the way, on to the uses for borax! If you’re in the UK/EU and you want to track some borax down, please note you’ll only be able to buy “borax substitute”. The reason being a few year ago the EU reclassified the ‘Borate’ group of chemicals that Borax belongs to as a dangerous substance! Apparently borax substitute still has all the same cleaning and laundry uses that original borax had and is pretty much identical, composition wise, but cannot be used for pest control. You’ll still need to store it securely away from children, preferably up high on in a childproof cupboard, and properly labelled, as it’s not a substance you want young children getting their hands on. And if you’re wondering where to buy borax substitute, I’ve seen it for sale in cardboard boxes in pound shops (in the cleaning aisle) and hardware shops for the princely sum of £1 for a 500g box. The brand is Dri Pak. It’s also available in larger quantities at the excellent Summer Naturals website. I’m certainly tempted to pick some up and give it a go around my house! For the dishwasher I like Ecover Dishwasher tablets in conjunction with dishwasher salt. They have a fresh lemon scent and cut through most dirt and grease. We ran out once and could only get a big brand name one in our local shop – I would say the Ecover matched it in terms of cleaning power. A box of 25 is around £5.50 and is widely available, and it’s also available in a big box of 70 for just £11.95 at Ethical Superstore*. For handwashing I’ve been using Bio D washing up liquid for quite some time now. I was initially sceptical the first time I used it as it doesn’t have much of a smell, and it seemed quite watery. My fears were unfounded as it’s got great cleaning power and is now the only liquid we use. It’s around £2 for a big 750ml bottle, and often available in Oxfam shops, as well as natural food stores. If you’re into bulk buying, it’s only £9.30 for 5 litres at Ethical Superstore*. For a few years now we’ve used Method Laundry Liquid and I’m really happy with it’s cleaning powers at 30°C. I even used it on my daughter’s washable nappies for over two years, which was a real test of it’s cleansing and freshening powers! It’s concentrated so comes in a little bottle, but don’t let the size fool you – it lasts around 25 washes or so. It costs around £6 but I stock up whenever I see it on offer, and you can even buy an 85 wash refill bag for £14. Lately I’ve been having problems with my washing machine smelling. After a web search I found that washing manufacturers don’t recommend that you use laundry liquid all of the time as it can clog your machine, especially if you always wash at low temperatures (scroll down to the section on causes of washing machine smells in that article). Did you know this? I knew that fabric softener isn’t good for your machine but I was completely in the dark about laundry liquid and low temperatures. 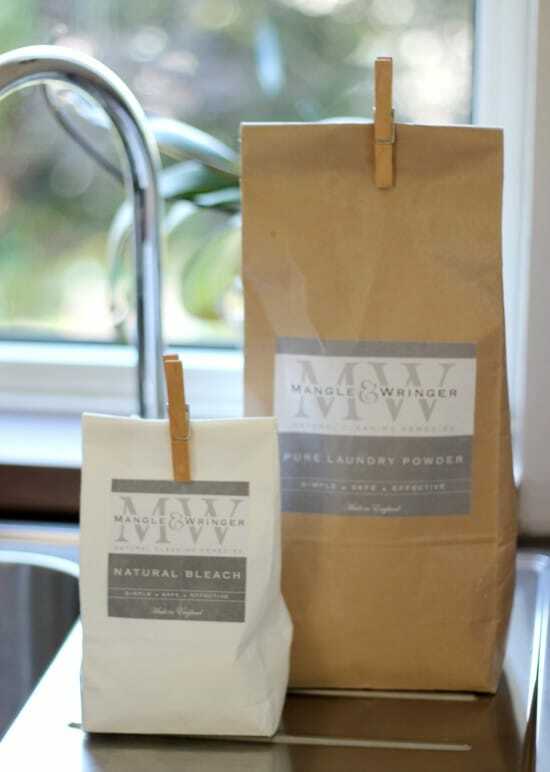 Thankfully Mangle & Wringer recently sent me some of their Pure Laundry Powder and Natural Bleach Powder to try out. As well as getting my laundry clean, it has really been helping with the washing machine stink (that and a couple of empty hot washes with a couple of dishwasher tablets! Honestly!). 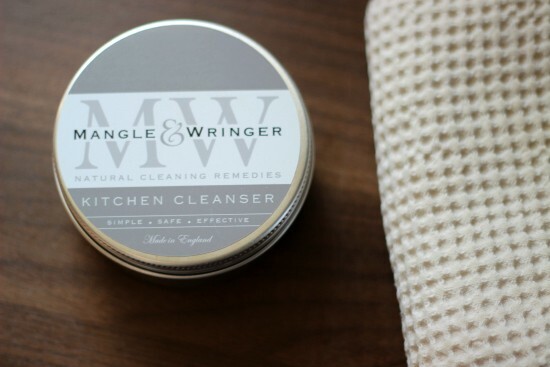 What I really like about the Mangle & Wringer products is that they are made from all natural food grade ingredients and are completely unscented. While the products are a bit more expensive at £9.50 for a 1.5kg bag of washing powder, and £3.50 for the natural bleach, it’s well worth it if you are sensitive to chemicals, or looking for an effective all natural washing powder. I’ve been washing my towels and flannels on a hotter wash (60°C) with the Mangle & Wringer duo and have been enjoying squeaky clean and soft towels with no synthetic scent or chemical residue (and a sparkly clean washing machine!). Don’t be frightened by the term ‘bleach’ – it’s great for stains or smells, even on colourfast items. We’re hand-down Method fans when it comes to cleaning surfaces. 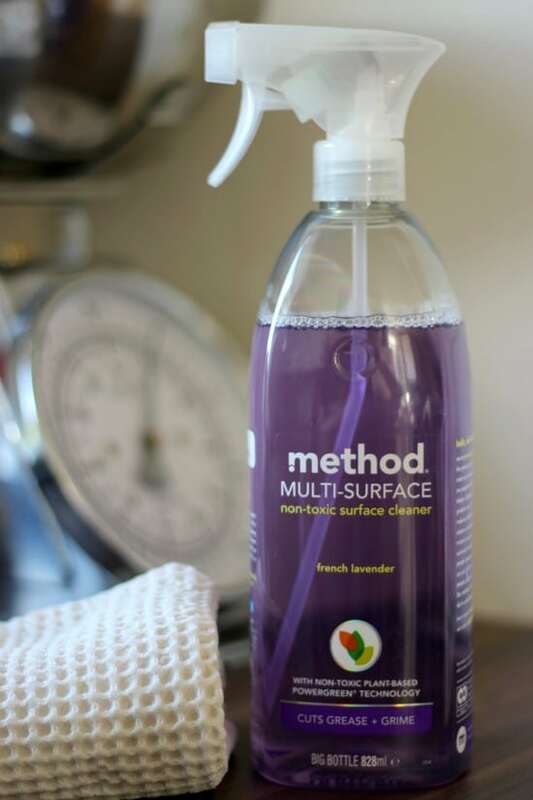 I love their lavender multi-surface spray (£3) – it smells lovely and cleans easily. You get a lot for your money in comparison to some other sprays, and I use it all round the house. I even dilute it in water to mop my floors. Basically, if I’m not using vinegar then I’m using this – lavender is naturally anti-bacterial and anti-fungal so it meets all of my needs. I mostly use bicarbonate of soda on tough stains in the kitchen and bathroom. If that’s not your bag then Mangle & Wringer again make an all natural cream cleanser for both the kitchen and the bathroom (£5.80 each), which they sent me to try out. I’ve found that the kitchen cleanser makes light work of food splashes on my hob, and leaves my sink and draining board gleaming. Meanwhile the bathroom cleanser tackles soap scum in my sink and shower with ease. Like the laundry powder, the cleaners are completely unscented and made with 100% natural ingredients, making them great alternatives to the big brand name chemical-filled cream cleansers. 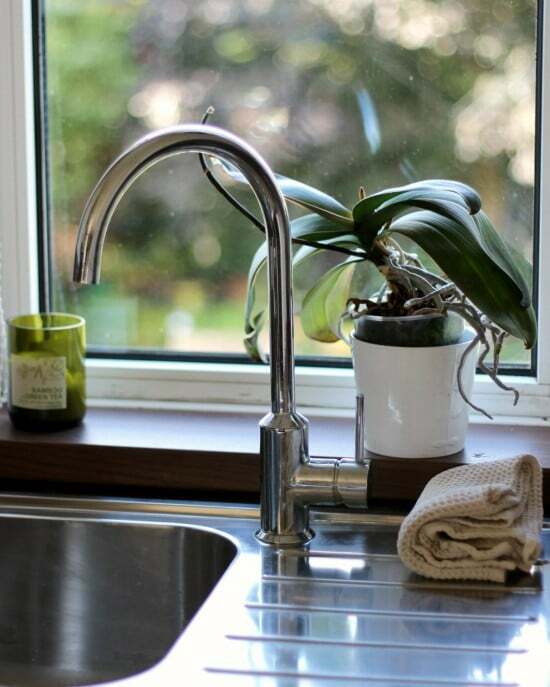 So there you go, a round-up of some of my favourite environmentally friendly cleaning products. Any favourites you want to add? Mangle & Wringer also sent me the products mentioned above to review. As always all opinions are my own.